Members of Reciprocal Clubs arriving Friday Harbor by boat, or other means of transportation, are welcome to visit our clubhouse. Visitors are asked to sign in at the bar where reciprocal information is maintained. The San Juan Island Yacht Club offers free overnight moorage on a first-come-first-served basis to members of bona fide Reciprocal Clubs. Our moorage is located on "F" dock, at the outside end-tie, in the Port of Friday Harbor Marina. 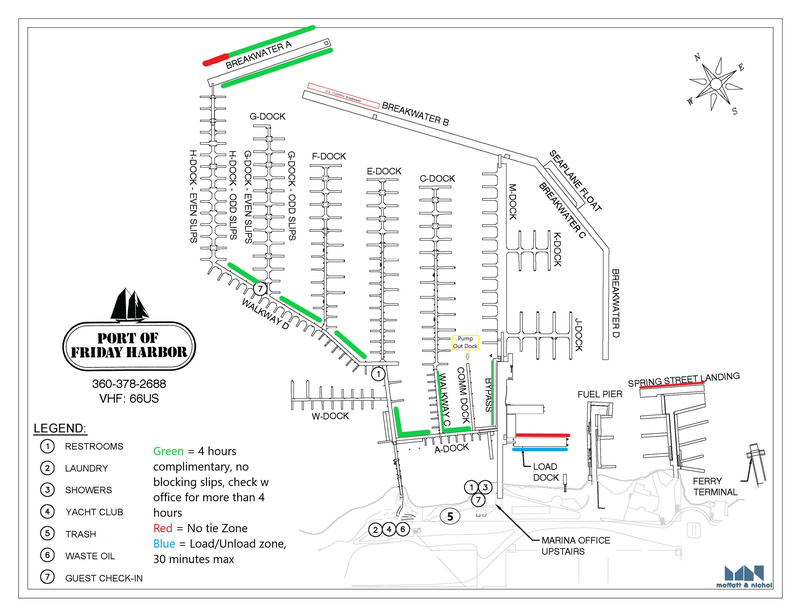 View the Port of Friday Harbor Marina Map here. The end-tie on "F" dock is 85 lineal feet with two power and water hookups. Please note: Rafting is mandatory when other reciprocal members wish to use moorage. Therefore, you must be willing to allow other to raft to you when you stay at the SJIYC dock. Rafting is permitted up to three boats deep. Dockside help may or may not be available depending on arrival time and availability of volunteers. Stays are limited to one night. Upon arrival, please check in with the Port of Friday Harbor as required. The Port office will issue a charge of $7.50/night for power and water. San Juan Island Yacht Club does not monitor Port of Friday Harbor VHF traffic (Channel 66). You may contact us by calling: 360-378-3434 during office hours. Please contact the Port of Friday Harbor at: 360-378-2688.